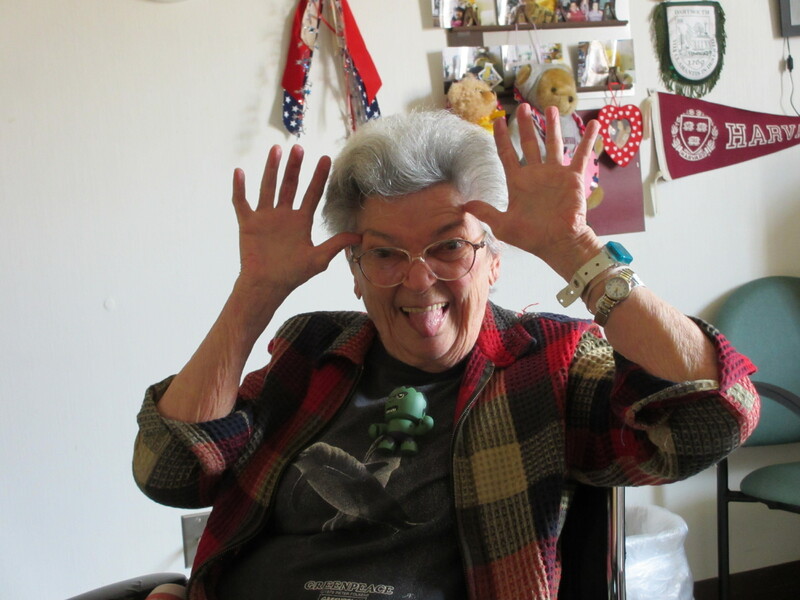 Home Comics Happy 84th Birthday, Marie Severin! Happy 84th Birthday, Marie Severin! I spent some hours with Marie in July. She was her usual hilarious self. Marie is someone who knows how to be happy. Hope that it’s an outstanding one and just the start of a year filled with rich rewards and rare wonders for you and your entire family. Remember me? We ha d a ball! Thanks for the update. It’s good to hear that Marie is still doing well. She is such a wonderful artist. Obviously her best-known material is her humorous work on such comics as Not Brand Ecch, and her style is very well suited to that. But I’m also quite fond of her Doctor Strange stories. When I recently did my three part look back at David Quinn’s mid-1990s run on Doctor Strange, one of the things I highlighted was that he worked with Marie on a few of his issues. I enjoyed seeing her draw the Sorcerer Supreme again in those comics. I’m lucky enough to have a copy of Kull the Conqueror #6 autographed by Marie – one of the Marvel greats. Happy Birthday. She used to come into the Staples I worked at to get copies made, it was generally the highlight of that day as she was always kind and in good humor. She was one of the people I was sad to loose touch with when I left. Glad to see hear she is doing well. Not Brand Echh is one of my favorite comics and I love Marie’s work in them. Happy Birthday Marie, and many more! Happy Birthday Marie! When I read the latest issue of Kurt Busiek’s Astro City (#4), the main character made me immediately think of you. It may seem odd since I never met you (although I wish I had), but based on articles about you, comments from fanzines, prozines, other pros, I feel as though I know you like a good friend. There were attitudes and mannerism about this character that for whatever reason I’ve projected onto you over the years. All good! You have always been one of my most favorite artists. There are sequences in your Kull work that I have used in art classes to explain the mastery of panel-to-panel story telling techniques. Most especially the panels with the ring consuming Thulsa Doom. Happy Birthday Marie! Thanks for all the fun drawings! You all might like to know that when we visited Marie recently, we brought with us a printout of all your good wishes above. Marie was pleased–and somewhat bemused–to be remembered with such fondness. Marie drew the first Marvel comic I ever bought: Tales To Astonish #98. To me, her pencils with Trimpe inks are still the definitive Hulk. I’ve posted several comments in the past couple of years about times her uncredited touch-ups were credited to other artists, notably the Hulk’s face on the classic Steranko cover of Hulk Annual #1, the faces of Len Wein, Marv Wolfman & their spouses in a couple of Rutland-based issues of Thor and the original SNL Not-Ready-for-Prime-Time-Players in Marvel Team-Up. Her style is both versatile and unique, much like her brother John. It may the only case I know of where you can see family resemblences in artwork. 3-29-17 I am a friend of Marie’s from high school. I was called by my last name: SULLIVAN. Saw NPR’s Helena Rubenstein/Elizabeth Arden last Sunday night. A great deal was made about the importance of packaging in putting across the sale of their cosmetics. It is my recollection that SEVERINS father designed the packaging for Rubenstein.. How is Marie? I have no contact with her since our mutual friend Eleanor Murphy died. RIP. Will this invoke a response? I hope so. 3-29-17 I am a friend of Marie’s from high school. I was called by my last name: SULLIVAN. Saw NPR’s Helena Rubenstein/Elizabeth Arden last Sunday night. A great deal was made about the importance of packaging in putting across the sale of their cosmetics. It is my recollection that SEVERINS father designed the packaging for Rubenstein.. How is Marie? I have no contact with her since our mutual friend Eleanor Murphy died. RIP. Will this invoke a response? I hope so. I DID NOT ALREADY SAY THIS!!!!!!! See above for today’s comment. i.e.March 29, 2017………A few years back Eleanor sent me a cartoon Marie did of herself wearing a sweat shirt emblazoned with the word C H A M P . She still had command of the page/placement etc. I did enjoy her and she me. We sat next to one another at reunions to gossip fiercely and hilariously (good-naturedly) about anyone we set sight on.